Labour MP Owen Smith pays a visit to our Croydon office to understand more about dotmailer and our role in the wider community. Owen Smith has been the Labour MP for Pontypridd, Wales, since 2010 and is currently running up against Jeremy Corbyn to win Labour leadership. 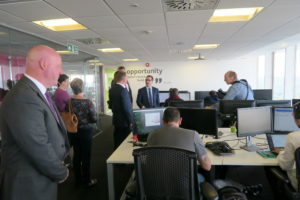 As part of Mr Smith’s tour around Britain to share his vision for the future of the Labour party, he popped into dotmailer’s Croydon Technology Hub to speak to the people behind our success. Mr Smith was joined by Steve Reed, MP for Croydon North, as well as Sarah Jones, the candidate standing for Croydon Central, who were interested in the role that dotmailer plays in Croydon’s regeneration and tech community. One of the Labour MP’s key focuses is to launch a major investment scheme to create jobs and improve Britain’s infrastructure. So it’s natural that Owen would want to visit a growing company like dotmailer, which is opening up opportunities for young people in an area of regeneration and empowering small to medium enterprises with affordable tools. dotmailer started out in Croydon in 1999 and we employ around 90 people at the iconic No.1 Croydon skyscraper, as well as a further 130 employees globally. We’re also proud to support Croydon Tech City, a not-for-profit organization responsible for growing and sustaining Croydon’s tech cluster and community. At a time of economic uncertainty in the UK after Britain voted to leave the EU, Mr Smith was also pleased to hear of dotmailer’s continued expansion in new regions such as the US and APAC. If you’d like to find out more about our career openings in Croydon or beyond, check out our vacancies here. Thanks for dropping by, Owen, Sarah and Steve. It was great to meet you and we’re pleased you like our platform!